Add some extra appeal to your commercial property with regular tree maintenance from SkyFrog Tree Service. 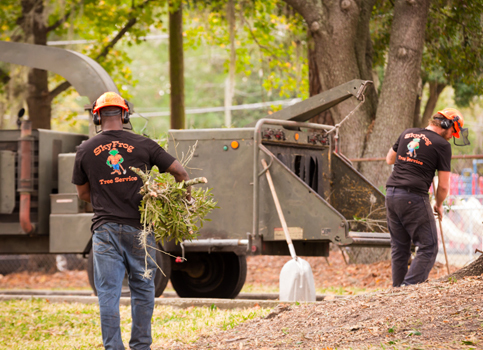 Our team has the experience and equipment to handle the trees of any commercial property and deliver quality results that have made us the tree care company businesses call throughout Gainesville, FL and North Central Florida. Trees give any property an aesthetic appeal while providing years of shade and comfort for Florida businesses. Like other parts of a commercial property, trees need maintenance from time to time. SkyFrog Tree Service cares for all varieties of trees with our comprehensive tree services. Though many people consider our tree trimming and Gainesville tree pruning services to be interchangeable, trimming removes overgrowth to allow proper moisture and light to the rest of the canopy and tree. This service is generally done twice a year and helps reduce the amount of potential damage done to a tree during a heavy storm such as a hurricane. SkyFrog Tree Service regularly prunes and removes dead wood from trees for a variety of reasons. Limbs and branches that pose a safety risk to people and property should be removed as soon as possible, while regular tree pruning in Gainesville helps maintain a healthy canopy and removes potential nuisance branches and limbs. Mature trees provide comfort and aesthetics to many commercial properties throughout Gainesville, FL. Keep these trees healthy for many years with our mature tree care services. Our certified arborists assess these trees for possible health issues and recommend solutions to extend the health and life of your mature trees. The benefits of commercial tree maintenance services goes well beyond a tree’s health and appearance. By regularly maintaining the trees on a property, you’re also helping the property, employees, and clientele at the same time. Trees overhanging roadways and common areas can shed twigs and leaves, creating a slight mess. Along with twigs and leaves, a larger issue is the risk of branches and limbs falling into these areas without proper maintenance. If large enough, they can damage a roadway surface and/or property such as vehicles parked underneath. Or, without regular trimming, overgrowth can reach into the clearance space for vehicles driving underneath and possibly mar a vehicle’s coat of paint. Maintaining the trees on a commercial property helps clear the way for exterior painting or any other renovations. SkyFrog Tree Service helps get the property ready by determining limbs that need pruning to clear space around the renovation area. The general rule of thumb is to remove any limbs within four feet of the building. Unmaintained trees block signage and building fronts for commercial property and give the property an unkempt appearance to clientele and passerbys. For multi-family residences, curb appeal factors into the property’s ability to attract new tenants and the trees will play a important role. If you’ve asked why tree maintenance is important for commercial properties, it comes down to dangers and hazards. Regular maintenance keeps trees healthy by allowing our arborists to identify health issues that could weaken structure of the tree, making it prone to dead limbs and roots. In addition to the health of trees, regular trimming and pruning of limbs and branches keeps overgrowth from occuring. Overgrowth is what usually breaks and falls during storms and high winds, potentially damaging the commercial property. By addressing these issues early, before a hazardous situation develops, you’ll have the peace-of-mind knowing your employees, clientele, and property will be safe. Your business already has a reputation for quality service and a superior product, so why not give the commercial property itself a boost with tree maintenance? Trees of all shape and size provide an appeal to a property and will do so for many years when you team up with SkyFrog Tree Service. Our team ensures those years through our knowledge, training, and experience working with the trees that dot the commercial properties throughout Gainesville. For the right way to prune trees on commercial property, call SkyFrog Tree Service today!